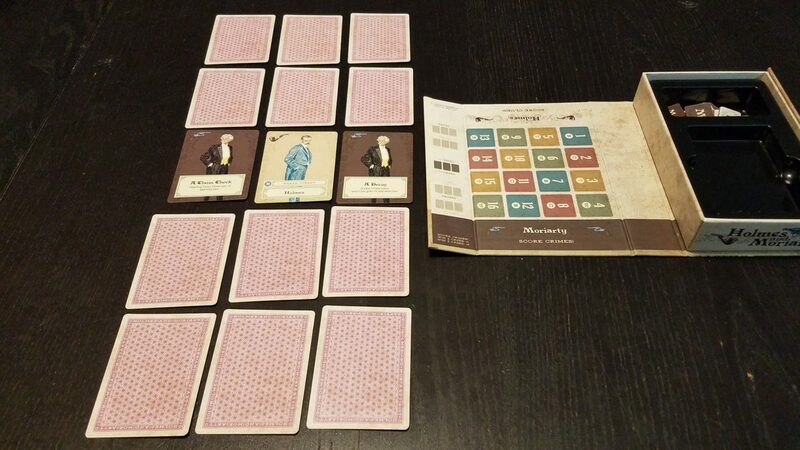 Holmes and Moriarty is an asymmetrical game for two, where the clash between these geniuses is represented by a series of trick taking rounds, where each player will try to out-fox the other in a battle of wits and intuition. …By doing some card drafting, of course. The board is conveniently built into the box! 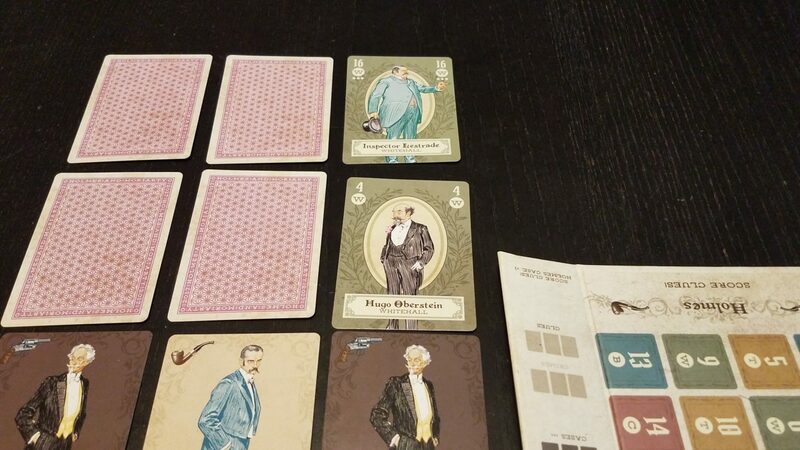 First thing’s first – Holmes and Moriarty is an abstract trick-taking game. By that, we mean that the gameplay and the theme don’t really intersect much – both players will be setting up a trio of 2-card hands, and facing them off to see who wins. 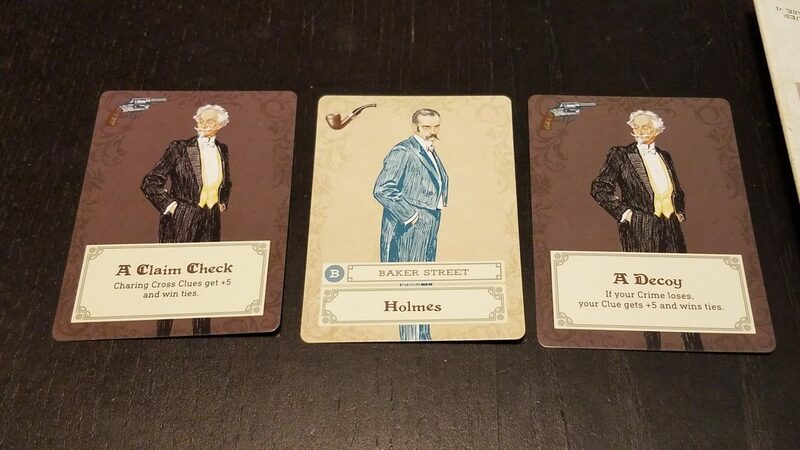 However, we like the theme a lot – Holmes and Moriarty is a surprisingly thinky, strategic game, and what better theme for a battle of wits than this classic literary pair? Holmes and Moriarty is played out over a series of rounds, and each round follows the same mechanical structure. Each player will receive a hand of cards from which they will pick 2, placing them as a pair in the first ‘case’ of the round – the lead card is the Crime and the rear card is the Clue (again, the theme doesn’t mean much of anything here, but it’s useful for describing the card positions, if nothing else). Now here’s where things start getting interesting, because depending on who won the cases for the round, some scoring tokens will be added to the scenario board (here it’s worth mentioning that the box itself becomes the board, which we thought was a neat touch). 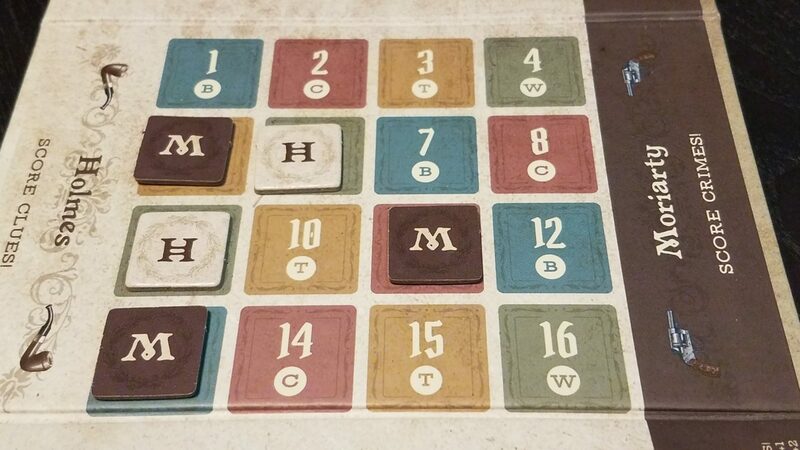 The placement of these tokens is the ultimate goal of the game – should Moriarty ever manage to get 3 of his tokens in a row, then his player immediately wins. 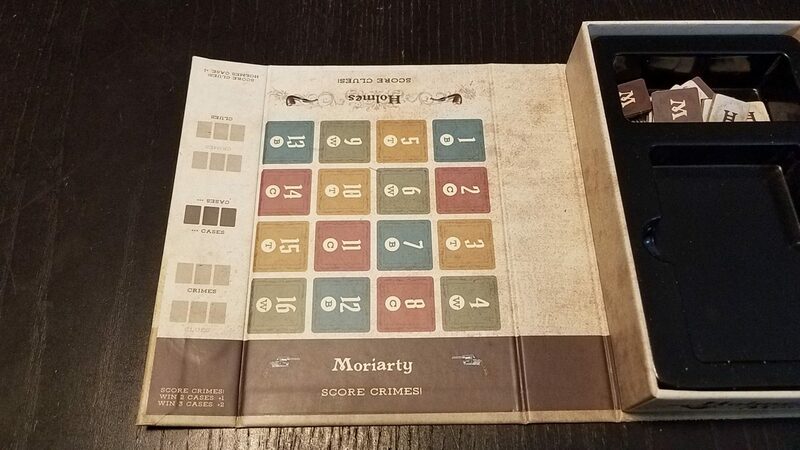 On the other hand, the Holmes player can win either by creating a stalemate on the board (where Moriarty can no longer meet his 3 in a row victory condition), or by stymieing Moriarty for 5 full rounds, at which point Holmes wins. 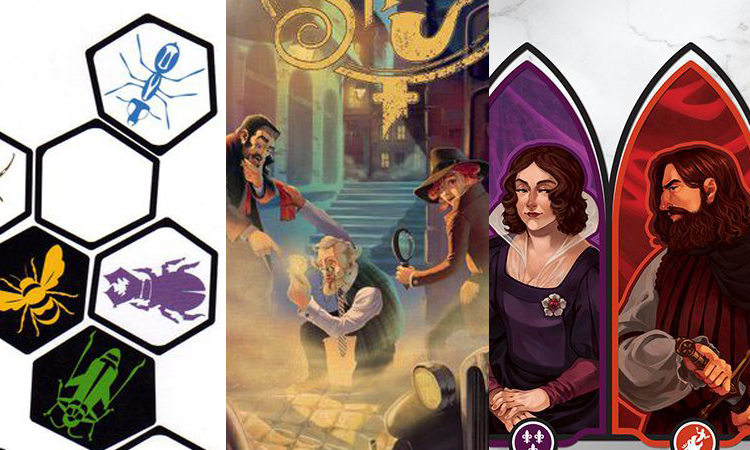 What’s interesting about Holmes and Moriarty is, despite its small size and modest presentation, there is a surprising amount of strategy that can go into this little game. Once grasped, the concept of building out the cases is a reasonably straightforward one; however, the real skill of the game is not in trying to build the most successful card pairs you can, but rather getting into your opponent’s head a bit and trying to fathom whether they will play evenly across the board, focus on winning (or blocking) specific cases, and how they might be drafting cards. The decisions in asdf are mechanically simple and not at all deep, but the variable of your fellow player is what adds complexity and depth. 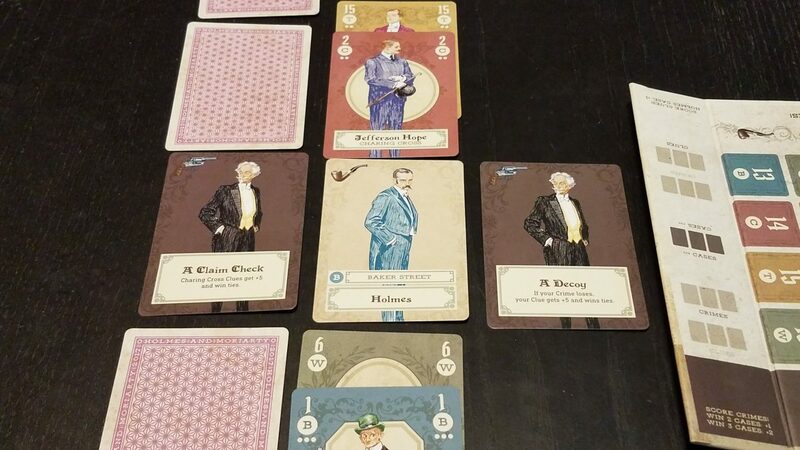 For a game of few rules, Holmes and Moriarty does suffer a little bit from a few small dings – in particular, there is a rule about how low cards roll over to beat high cards that feels unnecessarily fussy and poorly-explained; though, like the rest of Holmes and Moriarty, once you get it, there’s nothing to it. Another criticism is that the gameplay does not change – once you’ve played a single round of Holmes and Moriarty, for better or worse, you’ve encountered basically all the mechanics in the entire game. It is from the mind game of trying to out-wit your opponent that you will derive the greatest pleasure with this game. For those seeking variety of gameplay, look elsewhere. And in that regard, I recommend Holmes and Moriarty for pairs who will enjoy this sort of mechanically austere challenge to each other’s wits. It is definitely a game that rewards strategic thinking – I do believe that a player who has experience will beat a player who doesn’t, which is neither good nor bad, but is something to be taken into consideration. On the other hand, asdf’s investment of time is reasonably minimal – we’ve played it in less than 30 minutes going at full tilt – so a quick round or two for a new player to learn strategy won’t be a big loss at all. Holmes and Moriarty makes trick-taking work for 2, and that’s a reasonably rare thing. It’s presentation is quality and there is no pretension in its design or implementation – an excellent game for puzzling over with a worthy friend…or foe. For another great abstract game for 2: Hive – Featuring chunky tiles and an army of insects, this abstract fits the same niche of classics like chess, but its components make it playable on any flat surface (especially Hive Pocket) and its strategies are deep enough to be satisfying. 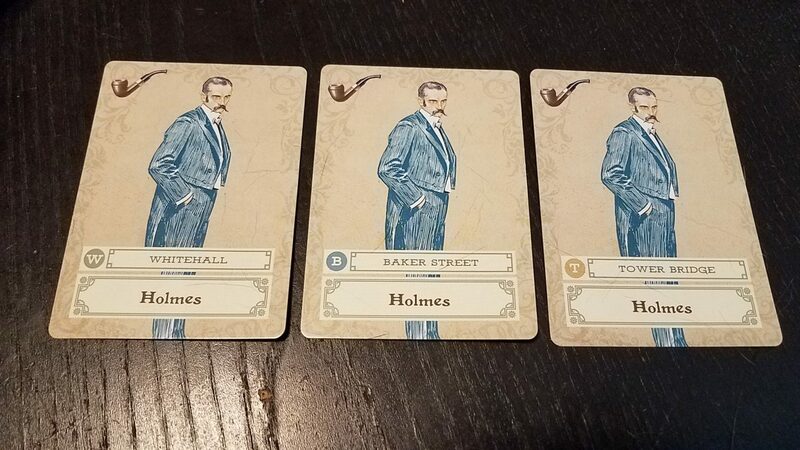 For another game with the Sherlock Holmes theme: Beyond Baker Street – there are lots of games that share this theme, but Beyond Baker Street is a neat cooperative exercise in shared hand management, with the twist being that you can’t look at your own cards. 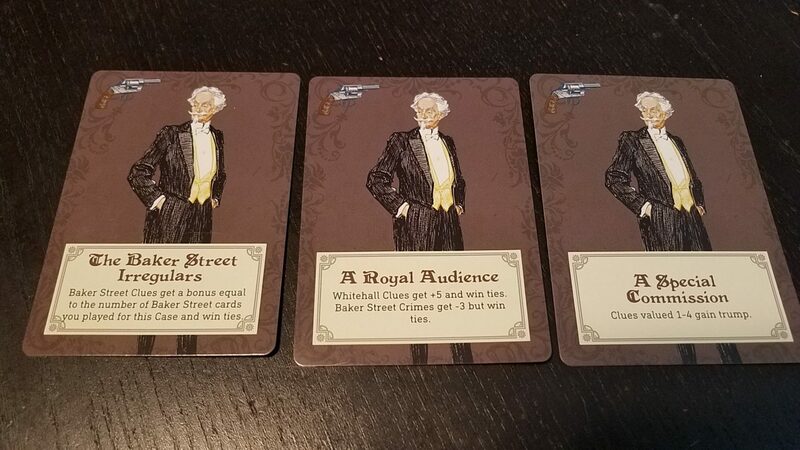 For another great trick taking game: Indulgence – This update of a classic card game by Restoration Games is a highly playable, gorgeously presented game that’s only major drawback is its narrow player count of 3-4.